Warning : the method presented in this article are too old to be applied now. Use this information at your own risk. Past days I did a spring cleaning on my computer ( spring cleaning on my web portfolio too ) . I reviewed last Arch, Chakra, Suse , Debian to be informed about actual systems . My choice stopped again* on Kubuntu , for the 12.04 LTS . Faster, cleaner and polished, I get totally seduced by it. The default artworks ( login screen -picture above- ; and wallpaper are also fresh and clean ) . Good job Kubuntu team ! It's also the first distribution where you can install in few minutes a full functional workstation directly from the "Software center" . 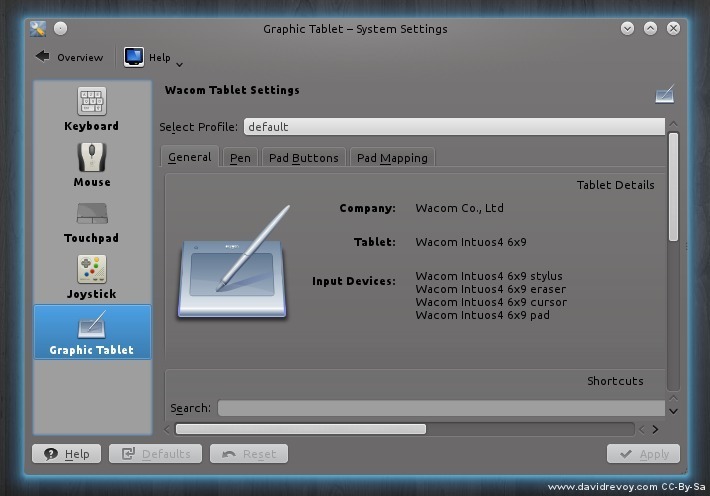 It has wacom tablet support plus Mypaint 1.0 , Krita 2.4, Blender 2.62, Inkscape 0.48.3 and Gimp 2.6.12 with not any single line of terminal to install. To give you an idea, those versions are the one I used for working on the Mango concept-art in February. So they are very fresh for stable package and it's a very good news ; you can now install them in Kubuntu and have a professional workstation ready. Ideal also for new users. Now, the last part of this article is about my notes for more advanced users. It's about testing version or compiled version. Now, if you want the unstable but more recent version and if you like to live dangerously , you'll have to open a terminal and start breaking things. 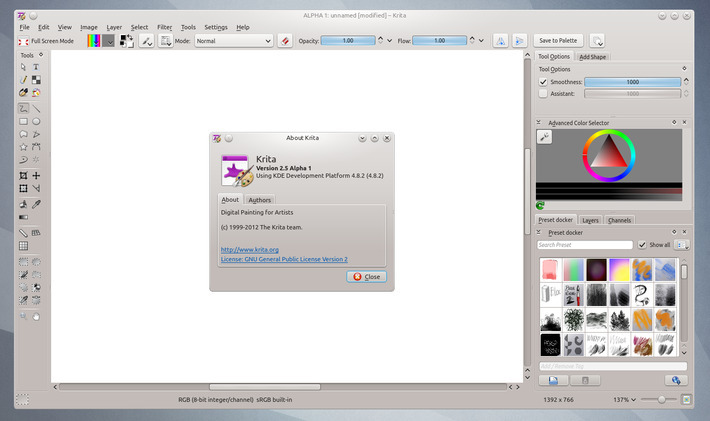 Kubuntu 12.04 is also ideal to install the last bleeding-edge softwares. The following will install the applications and you will be able to access them from the menu. Open 'Konsole' from the menu , copy the line under one by one (Ctrl+C ) then paste in your terminal ( Ctrl+Shift+V ). Accept with 'y' or 'enter' on prompt. Don't copy lines starting by '#' they are comments to help you to know what you are doing. Also , I advice you to read also the comments of this blog post, other users may wrote interesting warning or other useful infos. First, you might want to use Gimp 2.8 , still in release candidate, I hate the new brush outliner , but the single window mode is priceless. I don't use it to paint anymore ( I use mainly Krita ) ; I only use it for advanced image manipulation , and Gimp is really made for this. Gimp and the ppa will update at the same time you'll update your system. On the actual source version, Mypaint got new tools ( straight line tools ) , and better management of the document frame ( not rounded to 64px anymore ) . Also, Mypaint put a first step in color management. A must compile , imo. Note : if you installed a previous Mypaint version , uninstall it before from the software manager. note : You can install the dev version to all your system to can 'Open with' and also have it in your main menu. This is not clean because the code goes where package extract too, but at least on every method I tested ; it's the only one who works. # wait, it will be long. # In case of problem - it will probably happen -  ask for help on the script forum page. # reboot , Krita will be installed. # wait, it will be long , but faster than first compile. # In case of problem - it will probably happen- ask for help on the script forum page again. With the last years using tools not stable in production, I gathered some useful information. What to do when an unstable software got a big bug or don't want to launch after an update. Stop doing artwork ? no. All the informations for tester I wrote above works also on Ubuntu 12.04 LTS main edition ( screenshot of my test , to proove it ) , and so , I guess it will be the same for Xubuntu and all *.buntu/Mint/gnome-shell based on this release. I tested it deeply and it would be to long to explain what I dislike in it, so I'm back to Kubuntu, but I wanted to let you know about the compatibility of my 'how-to'. I hope you liked it. I need to proof test it all of this on a new install. If you have good feedback, share it. Now I'm back to my drawings . License: CC-BY David Revoy, www.davidrevoy.com, 26 april 2012 . Aahhh , spring cleaning fever ! Nice new website layout! I upgraded to Ubuntu Studio 12.10 last night, so far I like it. The important apps work (Krita, MyPaint, TVPaint), so that's all that matters. :-) I use xfce4 desktop, it's very lightweight and simple... don't like the new Gnome at all! @Anna Lina De Sario : :) here I have a background in object design and webdesign ( and also marketing and product ergonomy, product photography , lol I made all job ) so I still use this old Css and Html knowledge. I must admit that Css 3 made things less painfull than 10 years ago when for making rounded border or drop shadow it was all a painfull game with little div and background images. @Brett McCoy : Hey , thanks also for the feedback ; nice to see you btw on the Krita forum lastly. XFCE is really nice, and I will give it another test ASAP. It's the only desktop who offered native *.ora thumbnails preview 6 month ago. ( Unity/Gnome-Shell still don't do it by default and in KDE a checkbox in Dolphin have to be pressed and depend on Krita install ). Good you wrote 'TVpaint' ; I was a beta tester long time ago ; ( I also was a Mirage user ). One of the most impressive 2D painting engine. Your name comes up every now and then on the TVPaint forum :-) It's nice to have such a good animation app on Linux now, even if it isn't free. I am probably the only one using it on Linux but one is better than none! We need a thumbnailer for .kra file now! I wish I had time to help with development for Krita, since I am a C++ programmer, but I do that already for the "day job" and I come home and just want to paint or make music! @Brett McCoy : Ok for idragosani , good to know ; I would never guess it. *.kra file are really similar to *.ora. I'm sure it's not a big work for a XFCE dev. *.kra are like *.zip, and at the root in the file there is a preview.png image for the thumbnail. So it's very a open document. If a system got a *.ora thumbnailer it's sometime only little to do. I will ask on #xfce irc channel. 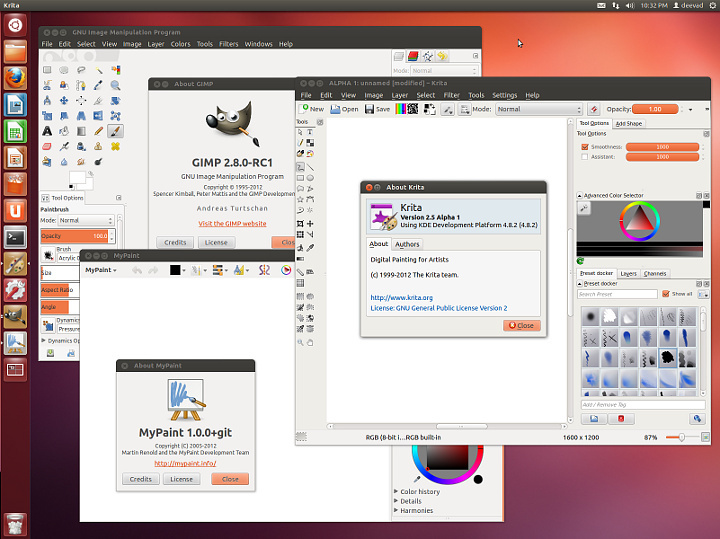 I've installed Mypaint on Ubuntu 12.04 and everytime I start the program I've to set my input devices again. Now I try to install the git version. @Marco :Aïe ! It sounds like a bug report to post. I hope the git version will solve it. For more infos : do you use the new tablet GUI in preferences ? maybe there is an interaction with this one. Here on my test with Ubuntu on a external drive I didn't remember to have trouble with Mypaint. I have to chack if the pressure was well enabled. I use a Intuos 3 for the moment. The Git version is really great and quite fast to install. Yes the bug is still there and I've used the new tablet GUI. But when I tried the git version of mypaint the wacom was disconnected, maybe I reboot and try again. 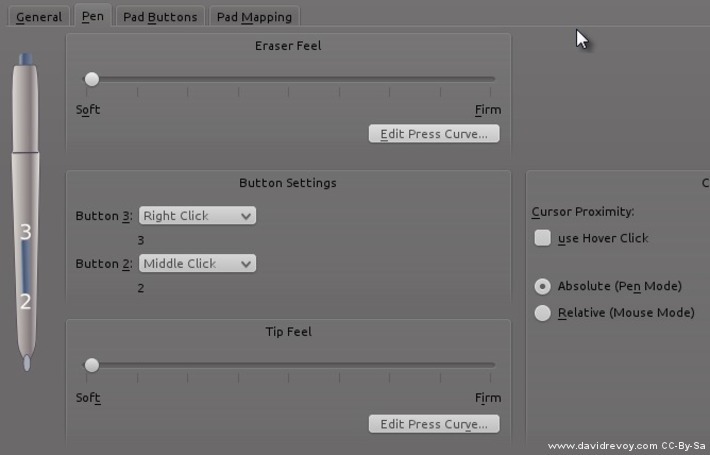 About the GUI: With the new tablet GUI I tried to map the left buttons on the intuos4, but it didn't work. @Marco : Good your install of Git version worked well, too bad it doesn't fix the problem. For the Gnome 3.4 GUI , I didn't use it and still rely on a good 'old wacom.sh script with xsetwacom command line ; I can't with the GUI set modifier ( Alt / Ctrl / Shift ) to the button ; even on the stylus I cannot set a custom key on it. So, I don't know if it's a technical or a knowledge limitation of use on the design XD It seems obvious normal user wanted to perform this task... Yep, a bit a deception about this over advertised Gnome 3.4 Gnome tablet GUI. 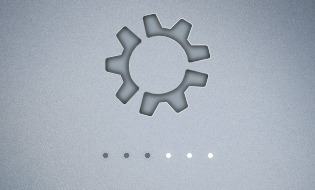 Still far from the awesomeness of the KDE one who exist since more than a year. @DavidRevoy I remember you once mentioning about taking on the Fedora distro. What ever happened to that? Ahhh! I was just about to email you about the starting up of the next script of mine, but it seems I have been beaten to the PUNCH! Expect to see a Mate Respin of Ubuntu with the art focus coming from me in the future! Summer is still a mystery but I will do what I can for now. oops, forgot to add for you. Our buddy Mizuno is back and has a working GIMP PAINTER for Precise. :) For those not yet painting under Krita. the graphic tablet works, a part when I choose "sequence of lines" where it just makes lines but without the sequence. BUT the sequence works if I use the mouse...though the mouse works when I start the program, but if I move it out of the window I need to reconfigure it in Help->Debug->Gtk input device dialog. After that I can move out of the mypaint window and doesn't lose the settings. But I don't get how the Straight/Curved Lines works. I can make Straight lines, but how do I make the Curved ones? @Michael : Hey, My test on Fedora were really good. But there was no solution to install my canon scanner/printer on it ; also, I prefer the way the path are displayed on terminal with Debian. But in overall the perf were good, and not a difficult distrib. @André : Hi, KDE desktop ( so Kubuntu ) is particulary good managing multimonitors with the proprietary driver. With the package 'kde-config-tablet' ( sudo apt-get install kde-config-tablet ) you will have in the system settings a GUI for applying your tablet to a single monitor. Here I use this + nvidia driver and dual screen ( tablet mapped on 1 ). @Nathaniel Schultz : Hey Nathaniel :) Cool to hear you will work around a Mate solution. For Mizuno, he posted on the Mypaint mailing-list this : http://www.youtube.com/watch?v=hzUwPF1_6H8 ( portage of Mypaint brush to Gimp-painter 2.7.5 ). Good to see the Gimp-painter project is not past. @Marco : I will do a small video on the straight line/curve of Mypaint. But the basics : Shift to make a line ( unpress shift while doing it to be in free mode, or its constrained to a angle ). And when line is done , Ctrl+Shift and drag to bend the last line. For the bug you found, please open a bug report with them. Here I reported a middle mouse button panning who get a problem ( don't pan ). I've been hating Ubuntu for a while now. So I decided to give Kubuntu a try based on your write up. Not going to jump ship just yet though, but I have both 12.04 versions of Ubuntu and Kubuntu now installed on this machine. Kubuntu has done some pretty cool things, and I am curious about where they go with it. Once again I tried to install Linux Mint with zero success. Many other distros install, but that one seems to have problems with my hardware. Ok I've just submited the bugs. The curved lines option is really interesting. Hi, David. Thank you for the post. I'm actually a Xubuntu user and found your notes quite useful. 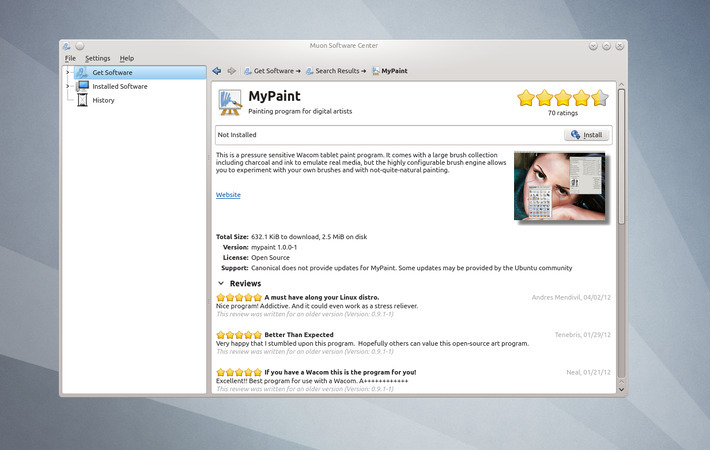 And I hope you don't mind, I "borrowed" your instructions for installing the latest MyPaint. No problem for quoting part, there is no many way to compile it and I'm not proprietary on the method to compile them :) so thanks to spread the word about Mypaint. Xubuntu is a really really cool desktop environment. And for sure the one from my last test who brings the best performance in all 2D softwares ; I suspect here my KDE to 'eat' the smoothness of Mypaint and Gimp. By the way , nice portfolio. @Todd McCullough & @Marco : cool. I've done something wrong. I'm pretty sure I followed your mypaint installation instructions properly, but the version of mypaint I have is 1.0.0+git. David, do you know what I may have done incorrectly? When did symmetry get added in?! And lock alpha!? @Mark Choi : Hi Mark ! Nice effort to started to test this change and not evident for someone new to Linux. For the tablet , you are lucky because your tablet is fully supported ( button / stylus / etc... ) exept... OLED ( little LCD labels ). It's possible to do, but ask still a lot of effort. Stay thuned on my blog, as I own a Intuos 4 medium for my travelling I will test a clean install of OLED label soon on 12.04. 3. Accept 'Y' and it will be installed from terminal. 4. Close terminal , reboot computer. 7. Normally the last icon will be a tablet icon, select it. 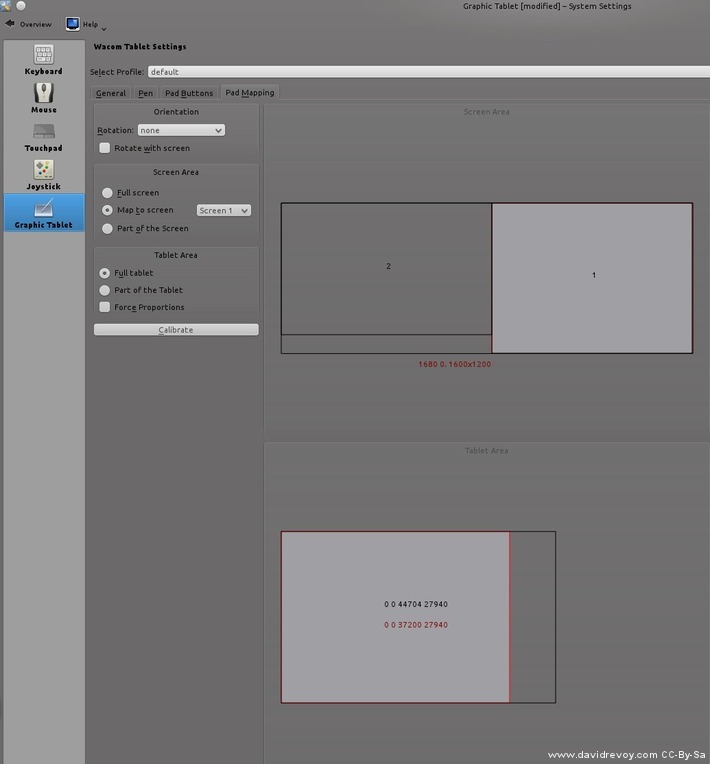 Now you have a full Graphic User Interface to setup your tablet. I hope you'll enjoy painting ! maybe you want to try the RC of "Mint 13". there are twio versions: mate and cinnamon. @Tom : Already installed both on a VM. 8) They are both nice. And LM13 will be perfect for all the PC of my family with older mint and used to gnome 2. For me , Cinammon have the same performance issue and oversimply low featured than Gnome 3. Although the initial plan for Xfce 4.10 was to integrate desktop handling in Thunar, we have decided not to do it at this time yet. Meanwhile, Xfdesktop has gained support for single-click operation, automated background image cycling and thumbnail rendering." just a quick heads up to say that I finally got around to updating my ppa for precise. 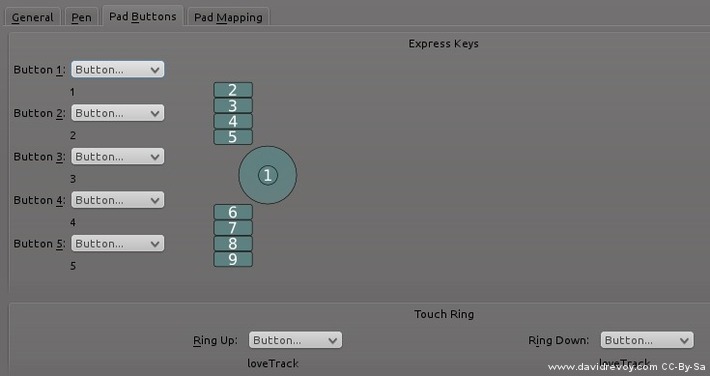 The main thing you will find interesting is a thumbnail plugin for dolpin for blender files. @Danni Coy : Hey Danny, thanks for the info on the ppa, and good tips to execute the ~/.profile directly. I'll update it as soon as I will do a retest on a virtual machine to be sure all is ok.
Hi, This is very useful post. Thank you very much. Just to let you know: For MyPaint-dev, json has been added as a dependency. I could compile only after downloading the pre-requisite libjson0-dev using apt-get. @Karthik Subramaniam : Hi Karthik and thanks for the feedback. Yes, Mypaint is knowing a almost full refactoring and even if I updated this page 2 weeks ago , it's hard to follow developpement. I added the library to the apt-get install line . Thanks ! I decided to to give Kubuntu 12.04 a try (my last distro was Ubuntu 10.10). It's ok so far, but I'm still trying to get used to the plasma desktop thing. Disregard the last question, I'm back to gnome :P (Linux Mint 13 Cinnamon). > make -j8 && sudo make install -j8 && cd ..
@Raphael Barros : hey Raphael, I see you also tried many things as me (thx to the destructive "desktop f***g war" in Linux ). This make error appear when you try to compile but you are not in the right folder to "make" it. For the moment, I can see only this. Feel free to add comments, if I can help. I think I'm doing this correctly, my terminal shows that I'm at "~/sources/gimp-painter-2.7/babl"
I tried to ./configure (I don't know, I thought it could help :P), and tried again the "make -j8 && sudo make install -j8 && cd .." command, the same error appeared "make: *** No targets specified and no makefile found. Stop." @Raphael Barros : Those directory are taken live from the source, and it's not rare a developper make a mistake. If you download it at this moment , you can experience it. Try to delete your babl folder, and retry to download it with the Git line code, with an updated version, you will probably be able to configure and make it. Another possible problem is you use Linux Mint ; I saw LM sometimes doesn't have the same package than ubuntu / kubuntu / *buntu , maybe you have library missing, and configure can't get the job done. Do you read any errors while doing 'configure' ? if the sources are not configured according to your hardware, it's normal the 'make' can't build it. Maybe it will help. all my encouragement ! @David REVOY : I've tried again like you said and got the same problem. Ok, I've found a solution for the gobject-introspection problem: I installed libgirepository1.0-dev , but the other problems persist. (I'm sorry for the double post, I've just found that "solution" and wanted to share). Your whole problem seems to be related to missing libraries. I didn't compiled the code recently, maybe other libs where added. >E: Unable to find a source package for gimp"
Or removing the # from it, if it's already there. and, probably because of that, the make for gegl doesn't work: "make: *** No targets specified and no makefile found. Stop." @Raphael Barros : Hey, good to hear you keep good and keep patience to install it. Not easy. 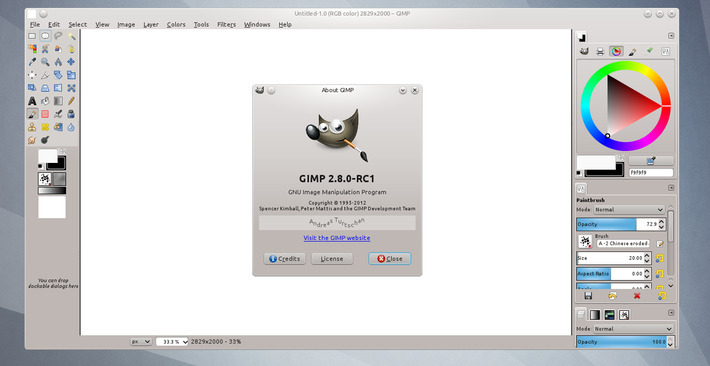 I was suprised that the linux mint team don't ship sames repo in a way ; good you found out for build-dep gimp. From reading your error , It seems your babl source code is not updated ; maybe the server went down or something like that. make -j8 && sudo make install -j8 && cd ..
also , here I use 'make -j8' because I have a corei7 processor with 8 cores ; adapt it to the number of core you have ( I forgot to specify it, but I guess make switch in auto mode when he doesn't find the number ). @Tyson : Hey, yes, I know the existence of this build ppa ; it's nice but not often updated. For me this ppa is a sort of 'unofficial' release. But I agree I should mention it as it works really great and it's less difficult to grab. Hey David, congratulations on Krita 2.5's release. Btw, I've been using the compiled version of Krita 2.5 until now. Do you know if I can just install it from the ppa suggested on krita.org/download without deleting the files created by Krita's compilation? Do you know if, if I run this script again, it will compile the stable version of Krita? @Raphael Barros : Hi Raphael. Thanks from all the Krita team :) (btw I'm just a tester/user , I don't code on it at all ). On Ubuntu you can't have the one installed from package and the one in sources -at the same time- . If you install the stable ; then it will override your compiled source install ( I think ). If you run again the script , it will automatically compile the 2.6dev unstable. it will switch the branch of the source code, to the branch where 2.5 is stored ; then you can launch the script to build the 2.5 code. I will also update the article now. Things changed a bit with newer developpement. :) Thanks a lot, hehe, yeah. I instaled kubuntu 2 days ago, ( i was trying opensuse, but its too much for me yet :D). Im already compiling krita to test out. Greets! @Angsinat : hey you'll probably like the new article I posted a minute ago. :) it's about instalation. Great read. Today the author had given a helping hand to the viewer as he had posted the methods for installing Kubuntu, which is becoming popular these days. Cheers mate. Keep posting in future also.